Are two video cards worth the cost? Installing two or more graphics cards that work cooperatively provides improved video, 3D, and gaming performance over a single graphics card. Both AMD and Nvidia offer solutions for running two or more graphics cards, but deciding whether this solution is worth it to you requires looking at the requirements and benefits. To use dual graphics cards, you need underlying hardware required by either AMD or Nvidia to run their graphics cards solutions. AMD's graphics solution is branded CrossFire, while the Nvidia solution is named SLI. There are ways to use the two different brands together. For each of these solutions, you need a compatible motherboard with the necessary PCI Express graphics slots. 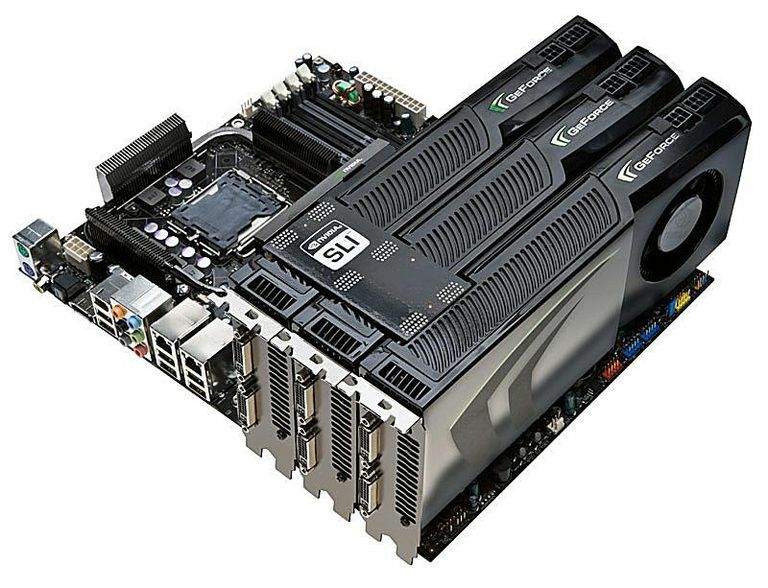 Without one of these motherboards, using two cards is not an option. There are two real benefits of running multiple graphics cards. The primary reason is the increased performance in games. By having two or more graphics cards sharing duties at rendering the 3D images, PC games can run at higher frame rates and higher resolutions and with additional filters. This extra capacity can dramatically improve the quality of the graphics in games. Of course, many current graphics cards can render a game just fine up to 1080p resolution. The real benefit is the ability to either drive games at higher resolutions such as on 4K displays that offer four times the resolution or to drive multiple monitors. The other benefit is for people who want to upgrade at a later time without having to replace their graphics card. By purchasing a graphics card and a motherboard that is capable of running dual cards, you can add a second graphics card at a later time to boost performance without having to remove the existing graphics card. The only problem with this plan is that graphics card cycles are roughly every 18 months, which means that a compatible card may be difficult to find if you don't intend to purchase it within two years. The big disadvantage to running dual graphics cards is the cost. With top-of-the-line graphics cards already reaching $500 or more, it's tough for many consumers to afford a second one. While both ATI and Nvidia offer lower-priced cards with the dual-card capability, it is often better to spend the same amount of money on a single card with equal or sometimes better performance than on two low-priced graphics cards. Another problem is that not all games benefit from multiple graphics cards. This situation has improved greatly since the first dual-card setups were introduced, but some graphics engines still do not handle dual graphics cards well. In fact, some games might show a slight decrease in performance over a single graphics card. In some cases, stuttering occurs that makes the video look choppy. Modern graphics cards are power hungry. Having two of them in a system can almost double the amount of power required to run them in tandem. For example, a single high-end graphics card might require a 500-watt power supply to function properly. Having two of these same cards might end up requiring around 850 watts. Most consumer desktops do not come equipped with such high wattage power supplies. Refer to your computer's wattage and the requirements before investing in the hardware. The performance benefits of a dual-card environment varies depending on the other components in the computer system. Even with two of the highest-level graphics cards, a low-end processor can throttle the amount of data the system can provide to the graphics cards. As a result, dual graphics cards are typically recommended only in high-end systems. Who Should Run Dual Graphics Cards? For the average consumer, running two graphics cards makes little sense. The overall costs of the motherboard and graphics cards, not to mention the other core hardware that is necessary to provide sufficient speed for the graphics, is prohibitive. However, this solution makes sense if you want to run games across several displays or at extreme resolutions.